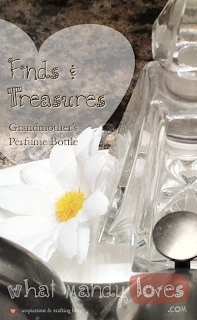 Glass perfume bottles are just one of the zillions of things my grandmother collected over the years. She always had several empty bottles on a shelf in her bathroom I couldn't help staring at while brushing my teeth. Kid Me would imagine what Adult Me would do with such a grown-up item. There would be makeup on my face done up like I've done it thousands of times before in shades that flatter my face and eyes. My hair would be in some fancy updo I'd have to Google to figure out how to do because it takes so long to look so good. Finally, I'd blot something light and flowery from out of those perfume bottles onto my wrists, rubbing them together like I've seen in old movies. Adult Me would be classy with a perfume bottle like that. Well... as my current Adult Me, I'm not exactly 1950's classy when it comes to makeup or hair or perfume. There will be days where I roll out of bed and not care, and there will be day where I channel this Fantasy Adult Me. No matter what Adult Me does with looks and smells, at least I still have one of these bottles to stare at while I brush my teeth. 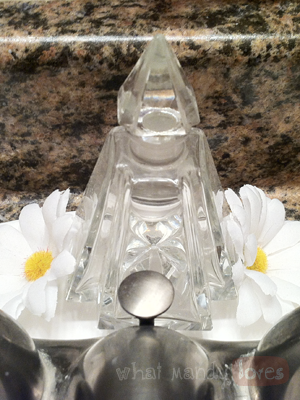 Behind my faucet & embellished with cheesy fake flowers, naturally.